I have been doing the design validation of my plumbing solution partly so I am comfortable that it is feasible and partly to write this up so that others have a model of how to approach this task. The last time that I did anything like this was with my current house where everything apart from taps for drinking water was fed off a (non-potable) header tank in the roof space and the central heating system was a classic 2-pipe (with branches) radiator system fed from a gas boiler. Even though our new house is a generation away in technology: passive-class, airtight to better than 0.6 ACH, low-temperature UFH in slab, pressurised water system using a Hep2O manifold / radial configuration, I still approached the design by refreshing my understanding of pipe dynamics, etc. using such reference works as this excellent intro into pipework calculations: John Heartfield, Water Flowing in Pipes I – The Theory and useful site like the Pipe Pressure Drop Online Calculator. The first is worth a scan if you want to get a handle on some of the sizing issues. 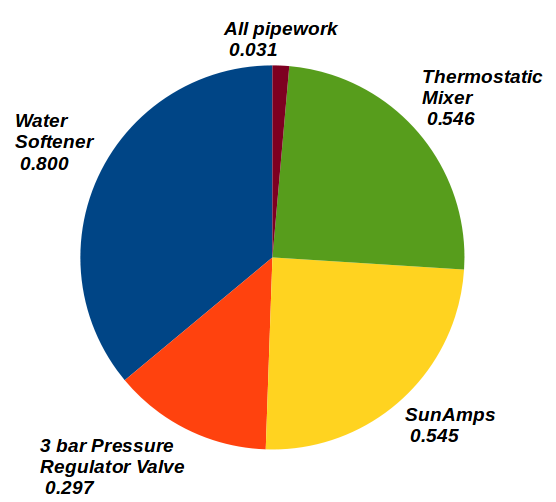 However, the figure above shows the pressure losses for the major system components in my Domestic Water System. Note that the pipework losses represent about 1% of the total pressure drop and this value is lost in the noise compared to some of the uncertainties on the larger ticket items. So it really is a waste of time worrying about the pipe losses in a pressurised radial system so long as your follow the following guidelines; this is not where you need to focus your design attention. Configure your pipe layout as a radial system. Try to avoid putting multiple appliances on a single pipe, except where there are strong practical reasons for doing do. For example, our dishwasher is adjacent to our kitchen sink and is a cold fill unit T'ed off the cold to the sink. Consider plumbing low-flow hot runs in 10mm, though there is a lot of simplification and little to be lost in going up to 15mm if these runs are short. If at all practical co-locate your manifolds, DHW storage, HW heating, and other directly related equipment in a single service area. This will keep all shared pipe runs short, and associated heat looses small. Properly lag all hot piping up to and including the manifolds. Lag the cold piping as well to avoid condensation. Whilst the pressure drop on common pipework is relative small, it is well worth while plumbing this in 22mm at a minimum. Pipe noise is still a risk so where practical use swept bends rather than tight elbows, and keep track of worst case flow velocities. Keep these under 1 m/s where at all practical and under no circumstances allow them to go above 2 m/s. User full bore valves and fittings where practical to avoid unnecessary flow restrictions. I then created a test scenario that I wanted to make sure that my system could cope with. IMO, at a minimum this should include two high-flow devices at full open setting running in parallel, but for our design I used what I considered a worst case morning scenario and that was one shower @ 10 l/min and 42°C, one shower @ 8 l/min and 42°C, and the kitchen sink @ 8 l/min 48°C. Note that if you crank the numbers using Dec/Jan water supply temperatures, this comes out at an equivalent instantaneous heat demand of 67 kW, and given that combi-boilers top out at 40 kWhr, this is well over 50% more that the largest combi- boiler could deliver. It's then just a case of doing the temperature blend and flow-rate calculations and cranking the numbers in a spreadsheet. On my first pass through, it was very clear that attempting to satisfy this short of flow rate through a single SunAmp was just beyond its rate capacity, but luckily we had already two configured in parallel. Even so, the parallelled SunAmps account for ~ 0.55 bar pressure drop, along with the DHW TMV. The water softener accounts for 0.8 bar and the Honeywell pressure regulator 0.3 bar. The difference in pressure drop on the 3 pipe runs (all being ~1% of the total) is negligible, but since the total is ~2.25 bar and the actual head is 3 bar, we have ample headroom to sustain this scenario. (Actually one of the showers is on the second floor, so in this case we lose nearly another half bar getting the water up there.) If the net figures are negative then we aren't going to achieve this flow rate and we will be system limited. But they are all positive, so we are OK, and this means that the taps or the various flow restrictors are going to have to do their work to limit the flow. So what could I do if I wasn't achieving the desired flow rates? Basically the answer either to revise my expectation downward (after all my current house design can just about deliver half of this); to increase unit capacity by upgrading in some how (e.g. in my case doubling up on the SunAmps), or to think out of the box. The biggest single hit here is the water softener, and in fact I introduced this fairly late in the design process when I realised that having one is pretty much essential with my level of water hardness, but that's life, I guess. Hi Terry. Really interesting read but I cannot help wondering if your worst case scenario is driving you towards a costly system. What percentage of days /minutes of the days will this worst case occur and how can you pay back the investment over what the putative 40Kw a combI / existing Sun amp pair could supply. It will take three people in the house to make the scenario work, one of them has to be washing up and they have to be synced up. Does this often happen in your home? It would be cheaper to throttle back the kitchen sink if the showers are running. The total cost of my potable water and UFH system is about £4½K and that includes the elements that I paid to MBC to put the UFH loops in the slab, but excluding reclaimable VAT and the bathroom and other end fittings. Is that expensive for a 4 bedroom house? And I avoid the Gas standing charges and maintenance, with my solution. @MikeSharp01 Mike, a slightly longer answer. First, I forgot to add in the water softener which cost nearly a grand and no doubt a few other odds and sods since this was just a running total in my head. (Jan keeps the accurate figures.) So let's say just under £6K. Even so, I know that a friend paid £18K for a similar sized traditional installation, but that was a bundled price including labour. When we laid out our house, one of the design parameters was a hub approach to the entire heating and potable water system, so having a small central services area (~ 1.4 × 0.65 m) off our downstairs loo was part of that. With the exception of the kitchen and the loft wetroom, all of the pipe runs are 3m or so from this, and the longest copper run is about 2m. I couldn't have done this with a UVC or a TS or a Combi for that matter, since I would have needed an outside wall to fit it against and this would have involved either completely replanning the house layout, or a 5m run from the Combi to the manifolds. What we've done here is to embrace the "sweet-spot" enabled by having a passive-class house that @JSHarris and others have described and optimised our heating and potable water design around that. So it's a case of "swings and roundabouts": super passive means that we can get away with no upper floor heating and rely only on the ground floor UFH. We can also go electric only and have very few components which need maintenance or that we can afford to have on a 2-3 day replacement basis, so we don't need maintenance contracts. So our bottom line is a system that is as stripped down and clean as possible, and yes the double SunAmp is part of that. But the final result is on the cheap end of the spectrum and very cheap to run on a yearly basis. Ok Terry that makes sense but are you still planning to increase the sun amp count or stick with the pair you have? Nope, two give us all the hot water that we need.